Rev. 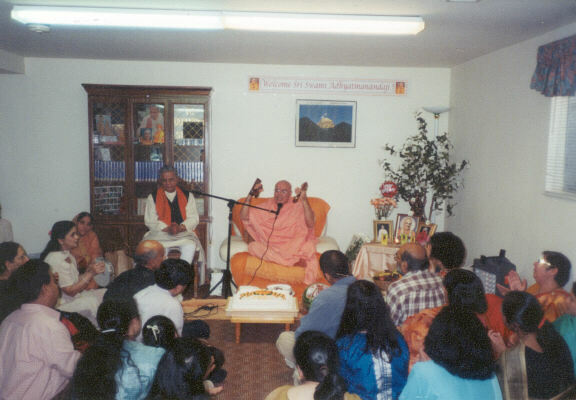 Sri Swami Adhyatmanandaji Maharaj was at Corpus Christi and Huston, Texas on May 1st and 2nd. 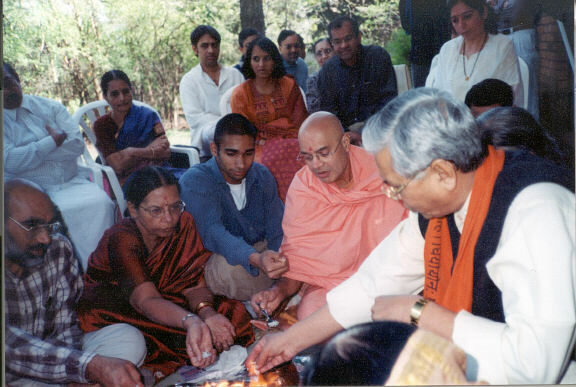 59th Birthday Celebration (May 3, 2003) of Pujya Swamiji at Chicago. On May 2 late night Rev.Swamiji arrived at Spiritual Life Foundation, Chicago. 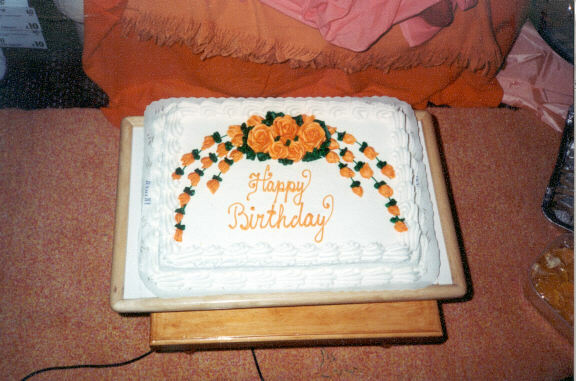 His 59th Birthday was celebrated with great enthusiasm. 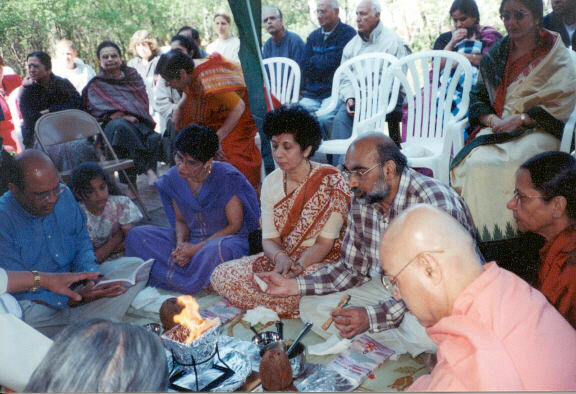 “Aayushya Homam “ was performed by very learned priest Dr. Dilip Vedalankar, who has spent pretty good number of his pre-youth years at Rishikesh at the holy feet of H.H. 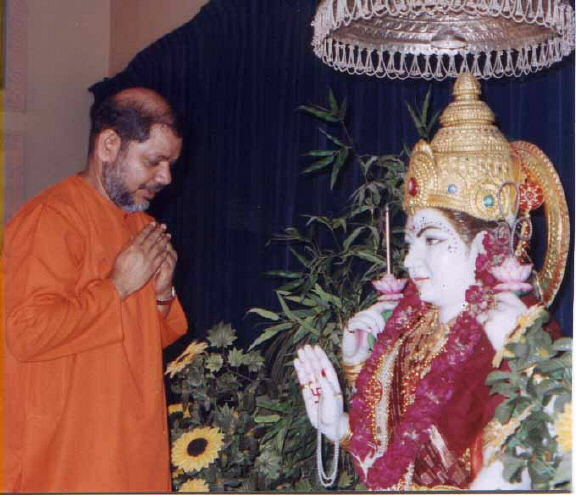 Sri Guru Bhagawan Sri Swami Sivanandaji Maharaj. 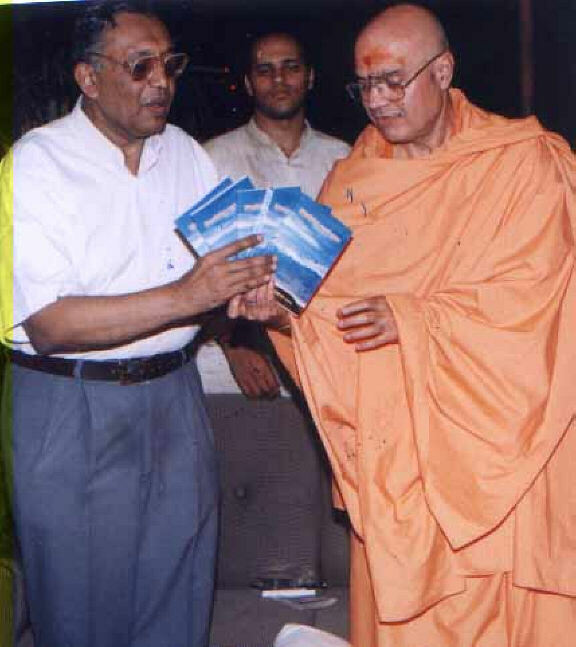 At that time Sri Dilipji was a student of Vedanta at Sri Gurukul Kangadi Vishwavidyala at Haridwar. 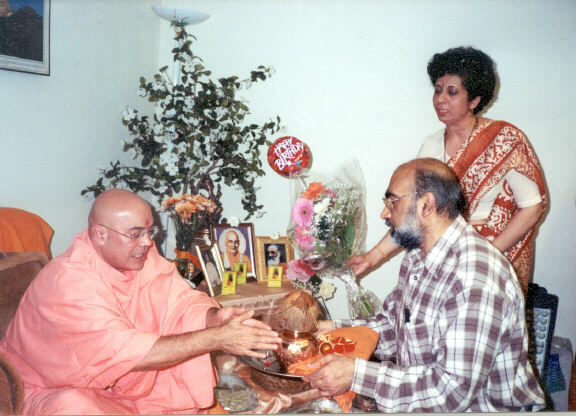 He shared his time and most precious experiences with Holy Master Swami Sivanandaji Maharaj. A large number of devotees greeted their Beloved & Rev. Swamiji Maharaj on this special occasion and enjoyed His divine satsang & soul stirring kirtan. Dinner was served to all after the function. 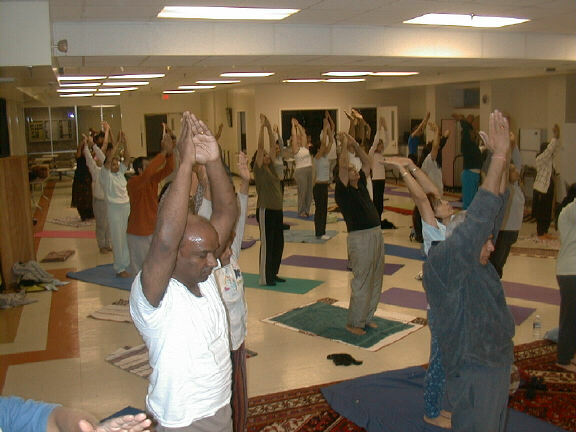 A week long morning Yoga, Pranayama & Meditation classes from 6.00 am – 7.30 am (May 3 - May 9) was organized by Hindu Temple of Greater Chicago. 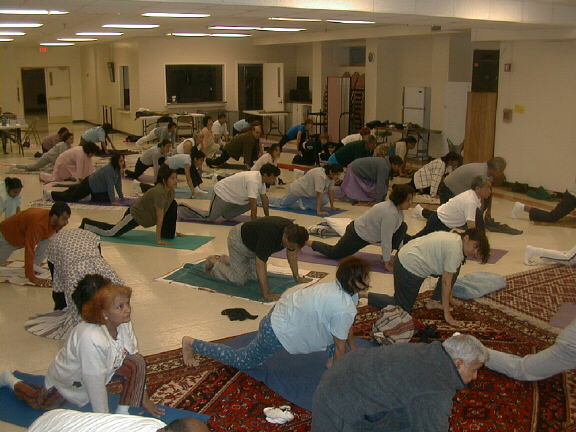 It was attended by large numbers of Yoga enthusiastic from all facets of life including yoga teachers & beginners. 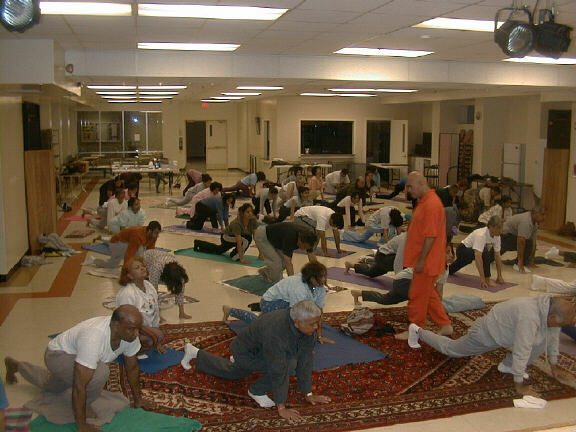 All were very grateful to Swamiji for teaching them very detailed and correct knowledge of Yoga. Rev. Sri Swamiji Maharaj was invited for discourses and satsang at Sri Sri Maa Anadamayi, Sri Arobindo and Sri Satya Sai Centers. Also Swamiji was requested by a number of devotees to come to their homes for visits & His blessings. May 9 & 10 Sri Swamiji Maharaj made quick tour of New Jersey and Philadelphia. On May 11 night he left for U.K.
With the Grace & Blessings of Holy Master Sri Swami Sivanandaji Maharaj, Pujya Swami Adhyatmanandaji Maharaj's " Shanti Yatra " has concluded peacefully. Pujya Swamiji’s holy presence and divine satsang during this “ Shanti Yatra “ in the West has brought solace to many spiritual aspirants & seekers of truth. 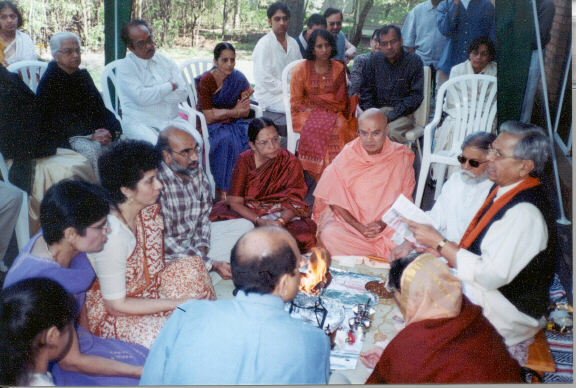 Pujya Swamiji had programs all over the USA. Seekers of truth accorded him warm welcome wherever he went and invited him to come back to USA soon. In U.K. Rev. Swamiji’s satsangs and visits were organized at Bristol, North health, Leicester, Kent, Kenton and many more parts of the U.K. Sri Anupam Mission of U.K. organized a grand farewell function for Rev. Swamiji Maharaj on May 23, Friday night which continued up to almost midnight. Rev. 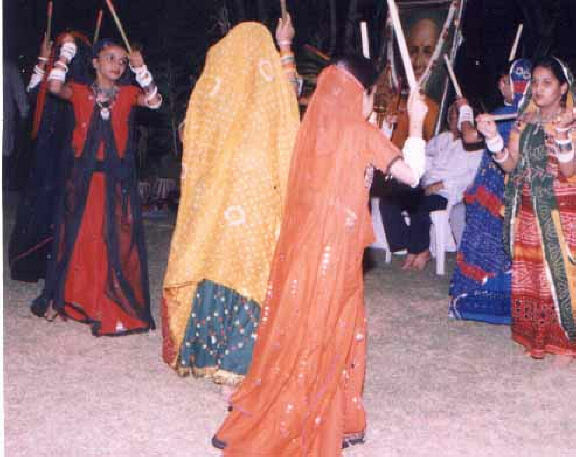 Swamiji Maharaj was received by Vedic chants, conch blowing and bell ringing at the International Airport Ahmedabad by a large number of devotees of Sivananda Ashram, Ahmedabad in the early hours of dawn. Sunday May 25, 2003 was chosen day for Lord Sri Vishwanath Mahadev’s annual celebration day. Entire day from early dawn to late night ashram was agoged with Rudra-Yajan. A book release program presided by Sri P.K.Laheri(IAS) chief secretary, Govt.of Gujarat. A memorable Bhajan Sandhya (an evening of devotional music) was organized and satsang culminated with grand feast (Bhandara). On May 31, 2003, Rev. Swamiji Maharaj went to Baroda for private satsang, Gurupaduka poojan and a meeting with leprosy colony patients at Sindharote with about 700 inmates of the institute. New kitchen for them was opened and feast was served to all. 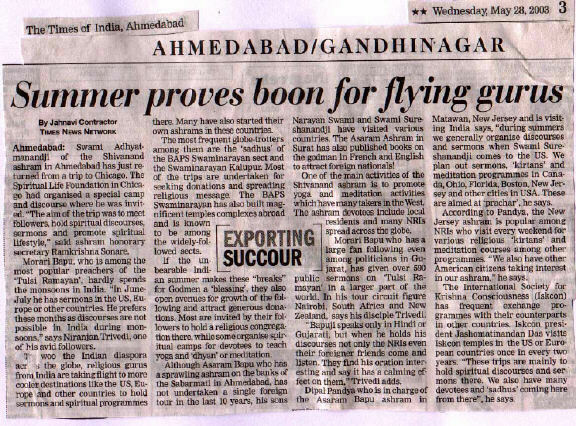 News from Sivananda Ashram, Ahmedabad. From May1 to May 8 ashram campus was humming with 114 kids enjoying ashram’s holy atmosphere. Camp commenced with Rev. 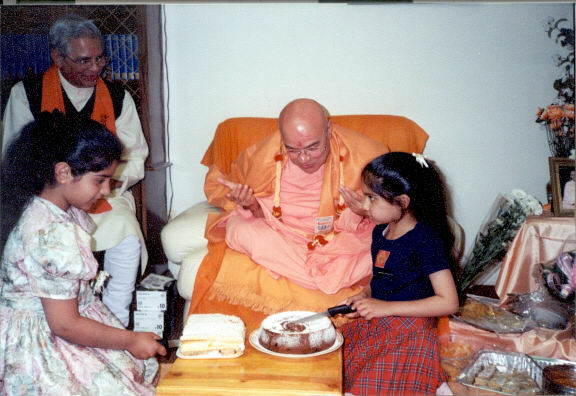 Sri Swami Adhyatmanandaji Maharaj’s recorded video message, as he was on his U.S.A., U.K. and Canada’s peace mission. Children from all over Gujarat participated in this camp. They were given the training of early waking up, Prayers, Meditation, Yogasana, Pranayama and helping themselves. There was forenoon session of Judo, Karate, painting, sports and music, which used to conclude with half an hour Mrutyunjaya Mantra chanting and mid-day meditation. After lunch, afternoon session of teaching them value based living through discussion & exchanging thoughts with learned and scholarly personalities. Evening activities included outdoor games and fun. After evening meditation and supper kids were amused by cultural programs. Chanting of Bhagavat Gita, Mrutyunjaya Mantra and Sri Hanuman Chalisa were also taught. Concluding function was presided by Dr. J.N.Moudgill (91 years old) and pre recorded video & blessings by Rev. Sri Swami Adhyatmanandaji Maharaj made everyone feel Rev. 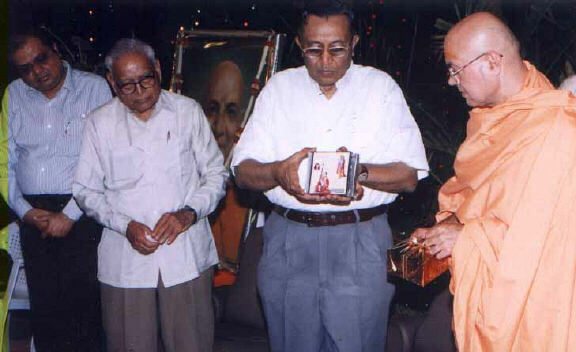 Swamiji Maharaj’s very presence there. 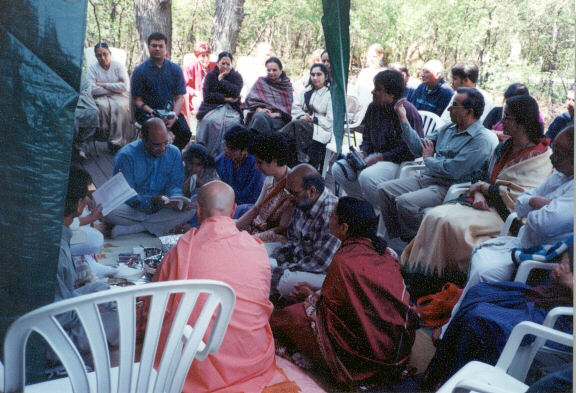 President of Central Chinmaya Mission Trust H. H. Sri Swami Tejomayanandaji Maharaj paid his divine visit to the Sivananda Ashram on May19, 2003 forenoon. Rev. Sri Swamiji Maharaj went to holy Sri Vishwanath Temple, Sri Dukh Bhanjan Hanuman Temple and Sri Sri Sri Ashta Lakshmi Bhavan, offered his offerings. Abhishek and flowers and received the grace of Mother Sri Adi Shakti. Chinmaya Mission Ahmedabad organized a five daylong youth camp. All male participants stayed at our ashram.